A very peculiar hypothesis has been presented  as an explanation for the big enigmatic fossil called Prototaxites. This fossil has been included into the chapter Enigmatic Organisms in  since it looks like a tree trunk but does not consist of wood, and it lived in the Silurian and Lower Devonian when plants on land did not exceed heights of a few centimeters. In order to obtain, in imagination, a big trunk-like fossil from the humble vegetation, the authors  invoke the idea of rolled-up mats. Liverwort mats on sloping rock surfaces are supposed to curl in at the upper end and eventually start rolling down the slope as pictured with artistic skill in Fig.1. Leaving aside the question how all those carpet rolls could become so tightly wound that their cross-sections remained nearly circular while lying around awaiting silicification, one can challenge the hypothesis by starting from the liverwort side of the problem. Small nematophytes recently found in the Rhynie chert provide surprising insights. 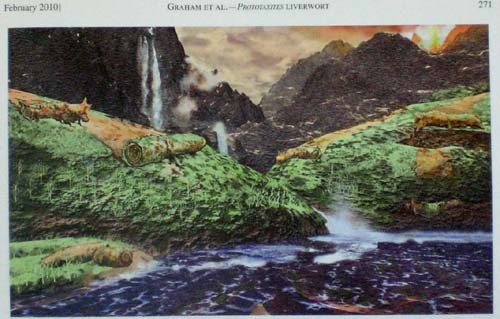 Fig.1: Prototaxites forming from liverwort rolls as imagined by GRAHAM et al. (2010) . Fossil liverworts are known since the Upper Middle Devonian . In order to have liverworts in the Silurian, the authors  had re-interpreted Silurian cuticles known as Nematothallus and Cosmochlaina (Fig.2), usually thought to belong to the nematophytes, as liverwort cuticles in a previous publication . Recent finds of nematophytes in Rhynie chert provide contrary evidence . A concise version of the presentation , focused on the explanation of the hitherto unexplained structure of the Nematothallus cuticle, is given in Rhynie Chert News 38. Fig.2 (below) with detail: Silurian cuticle Cosmochlaina, re-interpreted in  as lower epidermis tissue of liverworts with broken-off rhizoids but quite differently interpreted here. According to the interpretation proposed here, Cosmochlaina is a cuticle belonging to a nematophyte as originally assumed. 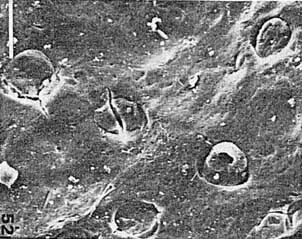 The round spots are the cross-sections or ends of the tube-like filaments embedded in gel which make up the nematophyte. Hence, the old problem of how a nematophyte could produce a cell sheet has vanished: There are no cells but only cracks. The cracks could be due to shrinkage of the drying surface of the lump of gel. The nematophyte could have released an organic substance which accumulated on the gel surface, polymerized into a decay-resistent cuticle as a protection against exsiccation, and thus preserved a replica of the surface crack pattern. Unexpectedly, an early paper on Cosmochlaina  supports the interpretation of Fig.2 as a crack pattern. There, specimens are shown whose aspect differs much from Fig.2, the most often reproduced picture of this fossil: See Fig.3. Fig.3 (right): Cosmochlaina as it is seldom pictured : no polygon pattern but early stage of crack propagation. Remarkable is the absence of the polygon pattern which is often thought to be an inherent feature of Cosmochlaina but is not. 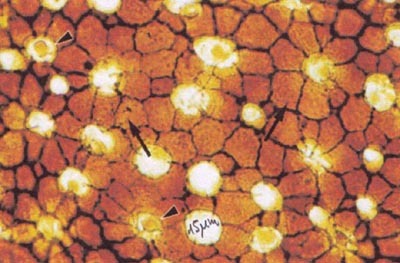 Apparently the cuticle in Fig.3 shows a very early stage of crack pattern formation, with only a few short cracks emerging from the tube cross-sections. 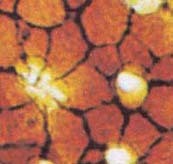 The transition from individual cracks to polygon patterns is not yet completely understood in fracture mechanics but the phenomenon as such is well known from various substances undergoing shrinkage.